Sturdy The Pok�mon is protected against 1-hit KO attacks. 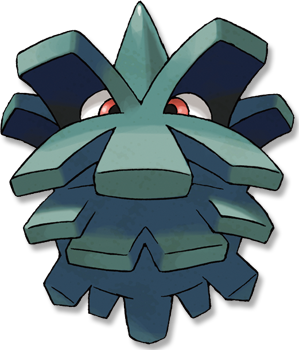 One-hit KO moves do not work on this Pokemon. Emerald A PINECO hangs from a tree branch and waits for prey. While eating, if it is disturbed by someone shaking its tree, it falls on the ground and suddenly explodes. Leaf Green It likes to make its shell thicker by adding layers of tree bark. The extra weight doesn�t bother it. Diamond/Pearl It looks just like a pinecone. Its shell protects it from bird Pok�mon that peck it by mistake. Platinum It looks just like a pinecone. Its shell protects it from bird Pok�mon that peck it by mistake. Heart Gold It likes to make its shell thicker by adding layers of tree bark. The additional weight doesn�t bother it. Soul Silver It hangs and waits for flying insect prey to come near. It does not move about much on its own. Black It looks just like a pinecone. Its shell protects it from bird Pok�mon that peck it by mistake. White It looks just like a pinecone. Its shell protects it from bird Pok�mon that peck it by mistake.